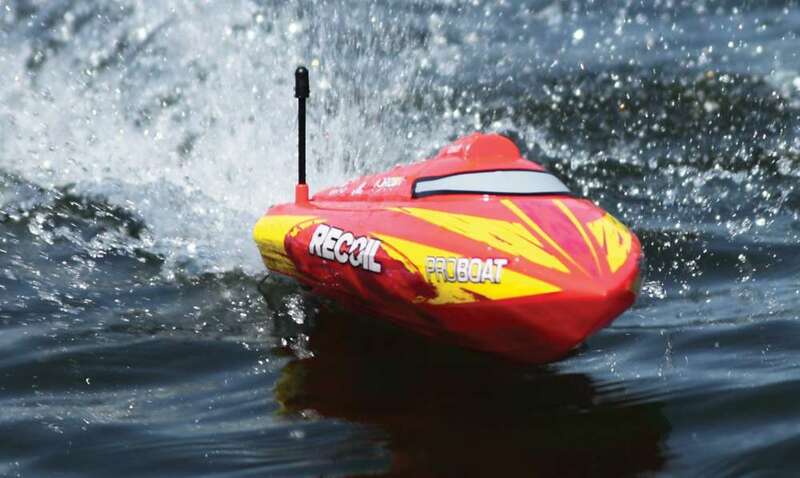 One of my biggest fears when taking out one of my radio controlled boats is for it to get stranded and flip over far out in the middle of a pond or lake. When this happened my first recovery attempt usually entails of getting another boat out and try bumping the stranded boat back to shore. The new Recoil 17” from Pro Boat address this fear as it features a new self-righting Deep-V hull. Coupled with a brushless power system that is water cooled once this boat arrived at my door I wasted no time is heading out for a test! I originally wanted the Recoil 17” to use in my nice new pool. Unfortunately for me it is much too fast for a backyard pool boat even though it is just under a foot and a half long. If Pro Boat had made the Recoil 17” without the sweet self-righting hull this little boat would still be outstanding as it is fun, fast and eye-catching. 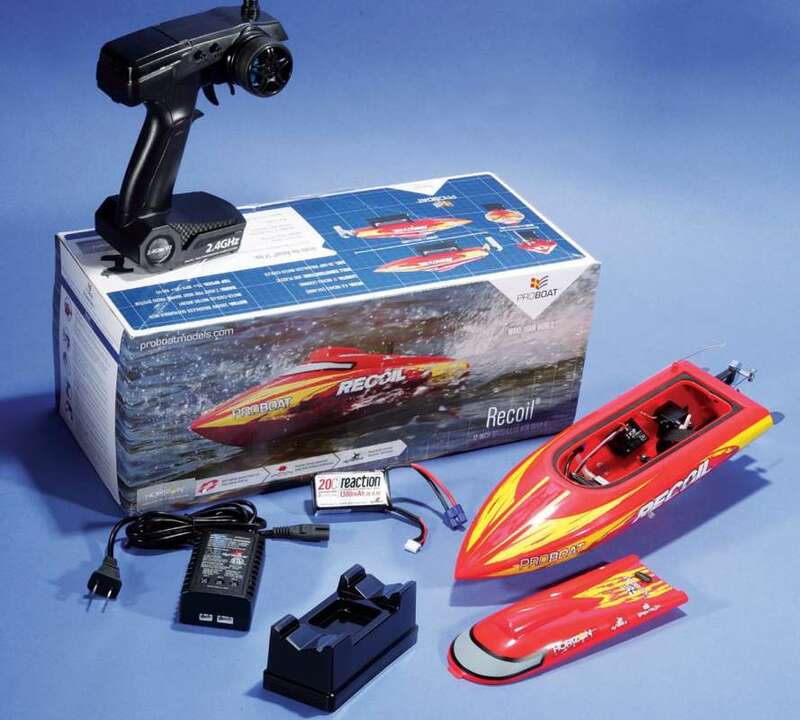 Even better, all you need are four “AA” batteries and you are set for some wet and wild fun. 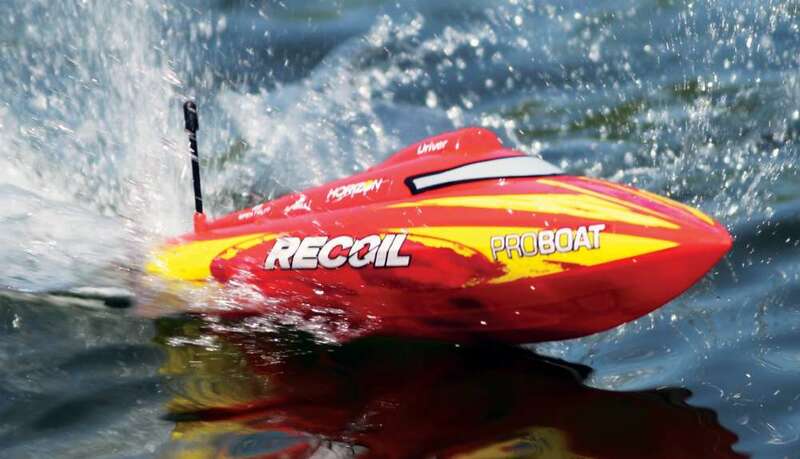 The Pro Boat Recoil 17” Self-Righting Deep-V Brushless RTR comes delivered with the 2.4GHz transmitter, a handy boat stand, 3S, 1400mAh LiPo battery pack, and 2A LiPo balance charger. The included instructions are very easy to follow and page five features an eight-step getting started guide. After a quick flip through the instruction book I hooked the included battery to the charger and decided to check out the boat itself. The deep-eve style hull is well designed to cut through the water while the canopy is held securely in place toward the back end with a lever that blends right in. A foam seal is secured to the hull where the canopy mates up to help keep the inside dry. The bottom left of the hull has a water pick-up that feeds the ESC and motor cooling system. The water is ultimately expelled out the left side of the hull. Starting up front inside the hull is the centrally placed water cooled 30A Dynamite ESC followed by the 2950Kv outrunner brushless motor. 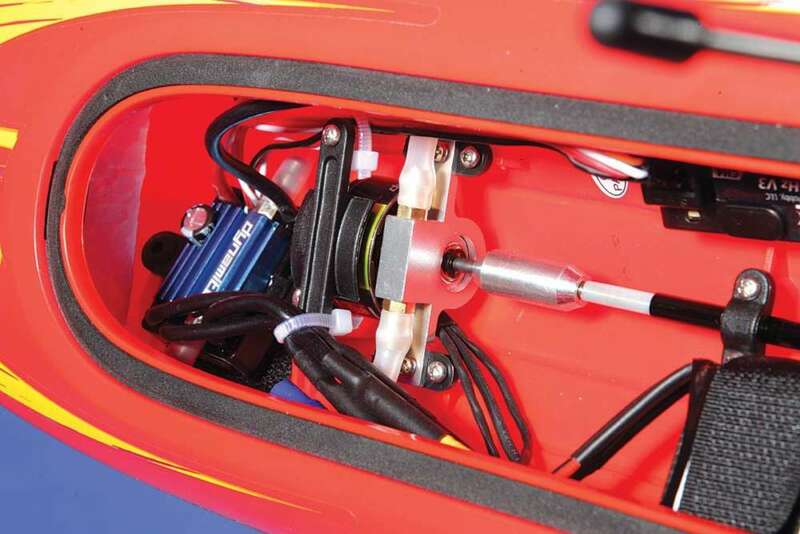 The right side is where the waterproof four-channel receiver and small steering servo are secured in place while Velcro straps are on the left to secure the provided 3S, 1400mAh LiPo battery. The back of the hull features an offset right aluminum rudder and adjustable trim tabs to alter how the hull cuts through the water. A small bend upward will aid the bow in getting up on plane as it gets to speed. Bending it down will push the bow down. It is best to start with these tabs straight or level and adjust from there as the wind and water dictate. Adjustable trim fins, found to the left and right help stabilize the Recoil 17” when taking a tight turn. A good starting point for these is 45-degrees. Right off the bat, I put the Recoil 17” in the water upside down and let it sit for a few moments. I then grabbed for the throttle and sure enough, as advertised, the boat righted itself! With that out of the way I decided to make a few sweeping figure eights around St. Martha’s Pond in Enfield, Connecticut to get a general feel for the Recoil 17”. This boat has some serious speed and nearly lunges out of the water when yanking back the throttle and the bow rose up out of the water very nicely. 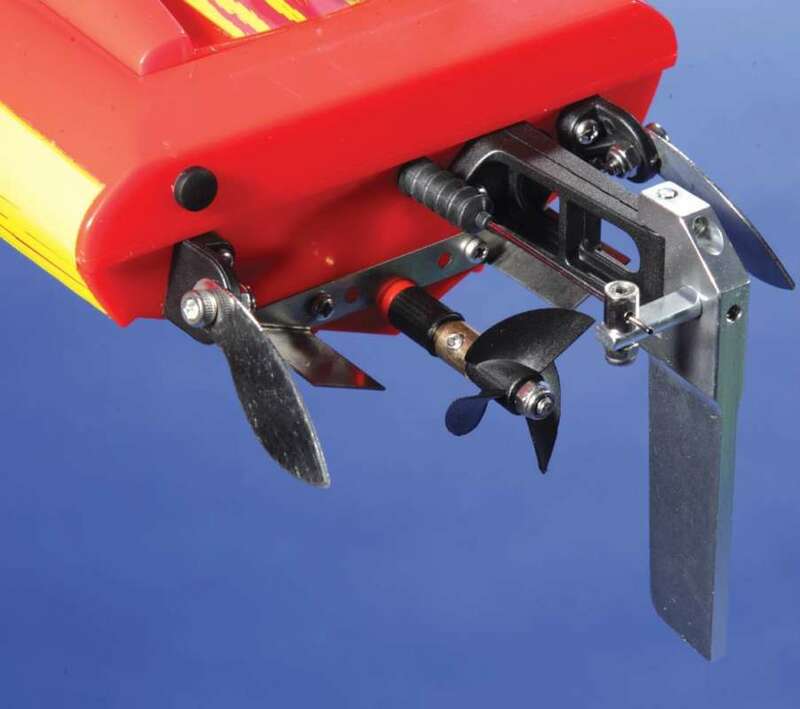 Steering response was spot-on when making sweeping turns through the water and was perfectly centered when cutting straight across the pond. Closer to shore I made some slow tight turns and have to admit that this boat has an excellent turning radius. High speed sharp turns, like with most boats, could be treacherous and on more than one occasion the boat pulled a complete 180 and a few times it capsized. At least with the self-righting feature I could easily get the Recoil 17” righted in the blink of an eye. I found that when making sharp cuts I had to get off the throttle just a bit to keep the boat stable and not turn the wheel to full lock. I also made a quick change to the trim fins, setting them at about 50 to 55 degrees, resulting in more stability when turning hard at high speeds. After about seven minutes on the water the power started to feel soft. Not wanting to get stranded far from shore I brought the boat back in for inspection. There was some small, insignificant debris around the rudder that had no ill effect on the handling of the Recoil 17”. I then took the canopy off to inspect the inside of the hull. The ESC and motor were just a bit warm, nothing too major. This told me the water cooling system was doing its job rather well. There was barley any water/moisture inside the hull but even so I pulled the drain plug to let what water was in there trickle out.